This story will resonate with anyone that is at a loss what to do after all your plans fail, or if you don't know what to do with your life. The bonus is learning about agriculture and the how not to take livestock for granted. It funny and heartwarming as it follows the ups and downs of life in an agricultural high school. It's a unique premise for an anime, and well worth the watch. It's nice to see actual character growth, and at the same time get a feeling for the culture of where food comes from. It's funny, has some drama, and the characters all feel very real as you watch them work through their own issues. The best part though, to me, is that there's a plot line, and the anime follows it without leaving a lot of subplots open and dangling. It stays on task and that seems to be hard to come by lately. Many people in our Anime Culture Club assumed this would be a bit boring, as it's slice of life and not all slice of life animes are very interesting or keep you engaged with plot. However, they were surely wrong, as this anime is filled with so much comedy, relatable characters, and it just has an air about it that pulls you in and doesn't let go. It was bittersweet at times, as it does pull on the heartstrings from time to time, but all in all, I recommend this anime any day of the week. I found this anime to be all around humorous. The story follows a high school boy who transferred from the city to agriculture. He knows nothing about farming or animals and a gets a hands on look on how everything works. There are emotional parts where he has to learn some hard lessons, not only about farming, but about, life itself. The anime also gives you an interesting inside look to how a city family can contrast that of a farmer's family. Cute show, funny good characters. I binge watched the show on Netflix, really liked it, hoped to find another season on Crunchyroll. I loved the animals and characters and learning more about the agriculture industry. I also liked the artwork. I would love to see more episodes made. 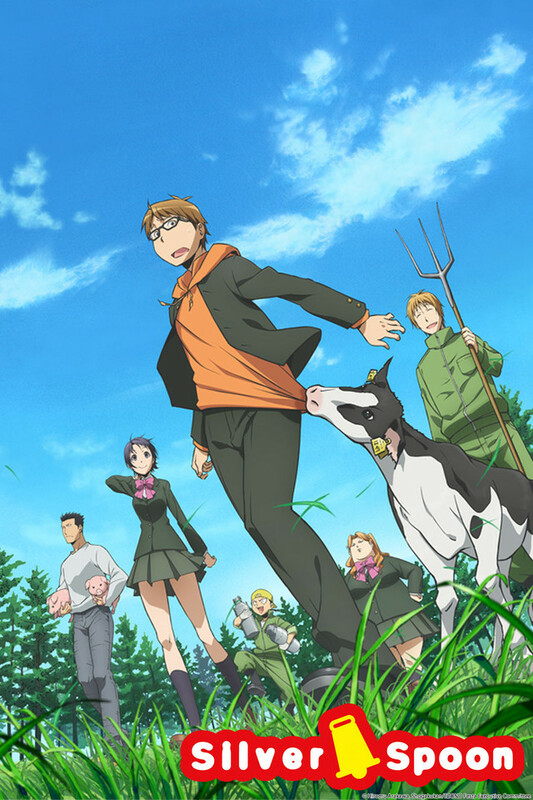 Of course you'd imagine that a farming slice of life would totally tend to be pastoral, serene, optimistic, and hopeful, but this show is actually about an industry, a sub-culture, and changing way of life, as it takes you on a tour of modern farming. Good recommendation for older city kids, who want to learn about the people who work to fill their bellies, and the ethics of food. This is a Slice of Life anime, that nails everything you'd want out of a slice of life. Relatable, provides insight, likeable characters, character development, silly humour, and overall just great story telling. This show is not perfect, but definitely re-watchable. Silver Spoon is about dreams, the protagonist, Hachiken, has no idea what his dreams are, yet. It is an anime about following your dreams and working hard in order to make that dream come true. The characters are so friendly and likable and each of them have that dream that they are working hard for, may it be becoming a veterinarian, working with horses, or inheriting their family ranch. But these dreams need effort and our protagonist begins to understand this and gets to know the world, that is farming. If you love an anime that inspires you to reach for your dreams and make it come true, this is an anime that you can relate to, not only that, you get to educate yourself with how a cow gives birth, for example. I haven't seen this, but I want to say the best farming anime is No-Rin which you can watch practically anywhere except Crunchyroll. That show is hilarious and watch it in English dub.